This Impex Hamburg large 3 lamp Empire style crystal wall light in gold plate is traditional and features a tall wall mount, with leaf and rope detailed frame adorned with high quality crystal. Draped crystal strings hang down from the top mount to a detailed half-round waist, with faceted crystal buttons and rectangular prisms covering the wall light completely. This gold plated wall light has three lights mounted on the wall bracket to light the whole fitting through the crystal for a spectacular display. An extravagant, feature wall light that will draw admiring glances wherever it is installed. From the prestige lighting collection, a spectacular large feature wall lamp, with style, quality and impeccable detail. Capture the glittering ambience of the Prestige lighting collection in any space whilst adding a focal point to any wall. Ideal for use anywhere in your home. 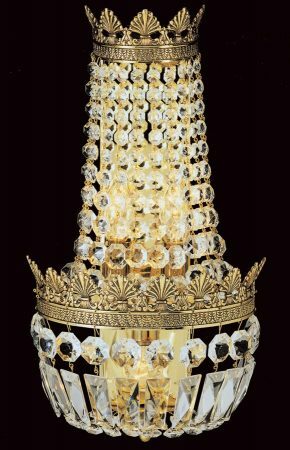 Impex Lighting are one of Europe’s leading manufacturers who supply a comprehensive ranges of fittings in traditional, contemporary and classic styles like the Hamburg 3 lamp Empire style crystal wall light in gold plate featured here.